the weekend? it was good. There was the zoo, a fundraising Booby-Q with a Hawaiian theme, a charity walk, Pizza Luce, riding the train, and not enough sleep. Good news? 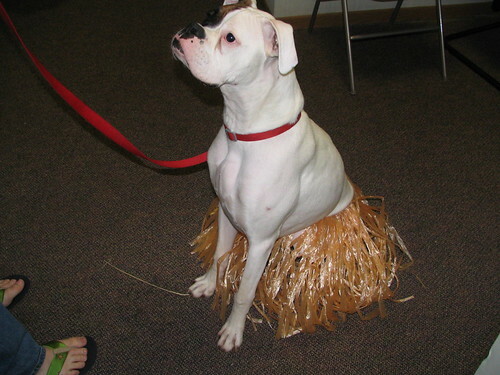 My dog likes wearing grass skirts and leis. his tail wagging through the grass skirt was so cute i wanted to die. Okay. You finally convinced me your dog is gay. OMG I don’t know whether to rescue Riley or die laughing.